The Drake Cafe is not new, and yet has retained an almost unexpected degree of hipness. Part of it is certainly its attachment to the Drake Hotel , that West Queen West bastion of artsy-luxe sleeping arrangements, and SkyYard upstairs. 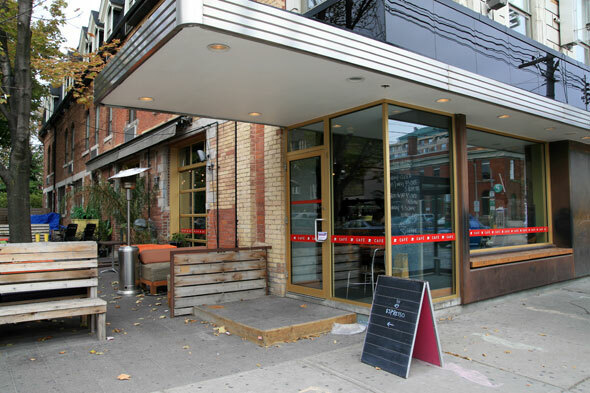 But part of it is the ineffable quality of its wooded, shady side patio, which remains one of the single best places to people watch over a leisurely weekend brunch of quick midday espresso. The interior resembles an honest-to-goodness cafe, with rich wood tables and black leather banquettes, as well as a chalkboard with menu items overseeing the large cash counter. Built-in shelves around the counter showcase teacups and the Drake roast, while freshly-baked goods are on display in a glass case, and intricate hanging lighting casts a diffused light over the room. The true appeal is its side patio, which comfortably seats both couples, and larger parties at wrought-iron tables. We went in a large group, and were afforded the opportunity to sample a fair cross-section of the food from the breakfast and lunch menu (served Mon.-Fri. 8-2 pm, and weekends 8-10 am). The club sandwich ($13.95) is--and this is damning by faint praise--just fine. It's competent enough as lunch food, but fails to stand out, largely due to its over-processed deli-style turkey, rather than the hand-carved turkey you might expect from the description on the menu . 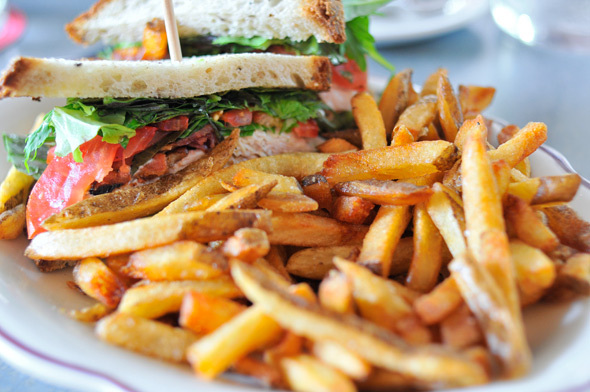 It also comes topped with bacon, avocado, and ranch dressing, all sandwiched in whole grain bread.The fries are, as always, perfectly crisped and utterly delicious. The tuna and white bean sandwich ($13.95) falls victim to the same overarching lack of enthusiasm. 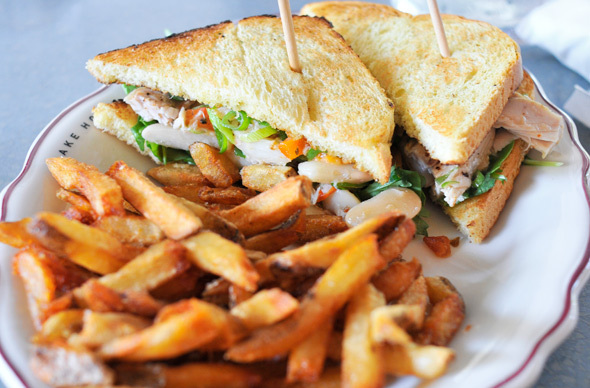 The pieces of tuna were slightly too large, rendering the sandwich somewhat unwieldy, with a taste that, at the end of it, wasn't especially memorable, despite the presence of sweet peppers and arugula. The Drake burger ($14.95, pictured above) is an old stand-by, and arrives paired with crispy fries. The bun somewhat overshadows the well-cooked cut of chuck meat, and each bite comes across as slightly dry, counterintuitive considering its generous helping of cheddar, Russian dressing and bacon. They also serve freshly pressed grapefruit juice ($4.75)--tart and without pulp, as I like it--and Americanos ($3.25). We differ on our opinions about the latter; I find it workable for my not-terribly-discriminating tastebuds, but one of my dining partners finds it too bitter and without crema. 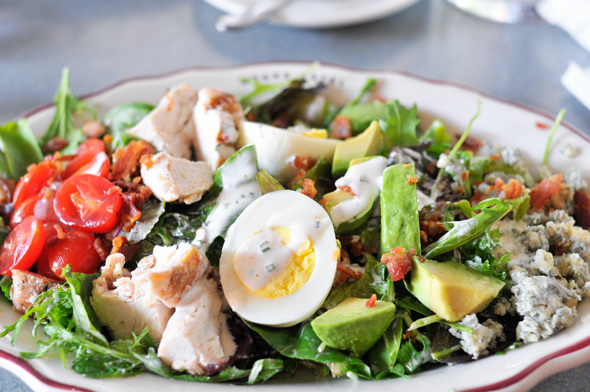 One of our lunch-mates frequently orders the Cobb salad ($14.95), and does so again. It's a fairly traditional Cobb salad, and the pairing of caesar dressing and blue cheese is sharp and tangy, while remaining flavorful, but there's a bit too much dressing on the plate. It comes topped with one sliced egg, and might benefit from another, but the dish works well as a lighter option. I order the house-made granola ($8.50), always unable to resist an opportunity to have breakfast outside of proper breakfast times, and it's delicious. 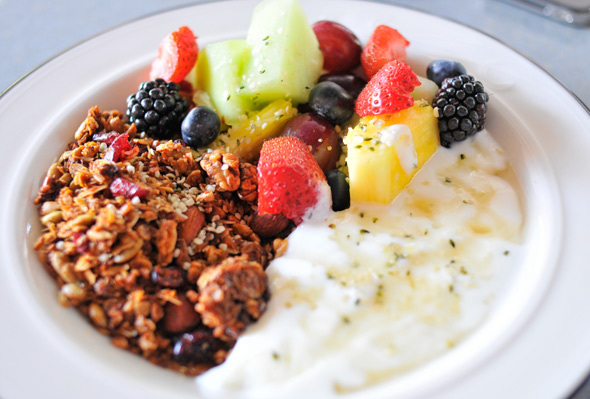 Crunchy, clearly hand-made granola with abundant nuts and hemp seeds, fresh fruit, a touch of wildflower honey, and tangy yogurt (available as fat-free), come together for a surprisingly filling plate. 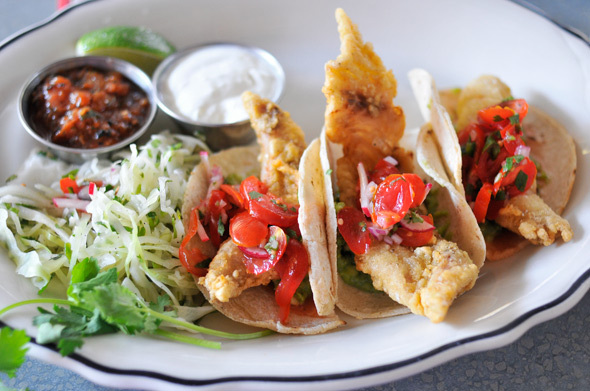 The fish tacos ($13.95) rounded out the spread, and arrived as a trio of corn tortillas, topped with guacamole, cherry tomato pico de gallo, sour cream and lime cilantro slaw. The fish rotates, and on our visit it's Pacific snapper, but the batter is not particularly flavourful, and the dish was rather lacklustre. The side salad, essentially a coleslaw, was basic but refreshing. Our large group left with an overwhelming consensus of "good, but not great"--that said, we took our sweet time on that patio, enjoying the summer heat, and the ever-present bustle of West Queen West.